A pensioner died after being hit by a car seconds after getting home from a night out at the bingo. Margaret MacLaren was just yards from her Black Isle home when the tragic collision happened. The 77-year-old had been in Inverness with friends and had just been dropped-off after getting a lift back from the Highland capital. The accident happened on the B9161 at Bogallan and the route between Munlochy and Croftnaceich was closed for more than 14 hours will an investigation was carried out. Mrs MacLaren was pronounced dead at the scene. She lived in a croft house at Bogallan with her husband Ian. Relatives at the family home were too upset to speak about the incident last night. Mrs MacLaren had been given a lift home by a friend. The pair made regular trips to Inverness to play bingo and it is understood that when the woman was told about the fatal accident she went into shock and had to be taken to the city’s Raigmore Hospital. 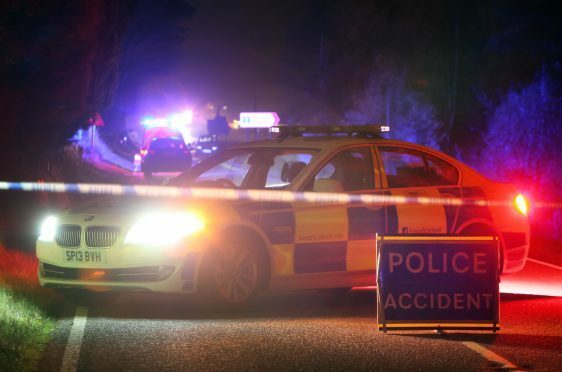 It is believed the driver of the car involved in the collision was from the Ross-shire area and was returning from a meeting on the Black Isle when the accident happened around 10pm on Tuesday on a long, straight stretch of road close to Munro’s Nursery. Police last night said that their inquiries into Mrs MacLaren’s death were ongoing, although it is understood that they are not seeking any witnesses to the collision. A spokeswoman for the force said: “Police can confirm that the B9161 at Bogallan on the Black Isle is now open following a road traffic collision. “The collision involved a 77-year-old woman and a car. Sadly, the woman died at the scene. “Police can confirm her identity as Margaret MacLaren, from the Black Isle. Black Isle councillor Isobel McCallum said: “Obviously it’s very sad to have an accident like this in our area. “It was in the dark and it’s a fairly busy road, the main road into the Black Isle.